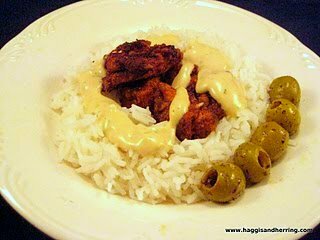 Chicken shawarama served on rice with tehina and olives. This shawarama recipe (given to us by Andrea Altberg) is a family favourite and goes well with tehina and olives on rice, as well as in a sandwich. 1. Whisk together olive oil, lemon juice, garlic and all spices in a large bowl.2. Toss chicken in mixture and let marinate for 12-24 hours, stirring mixture every 8 hours.3. Skewer chicken and grill for approximately 5 minutes per side or until chicken is cooked through.Serve with rice, creamy dill sauce (or tehina), hummus, pita and pickles. I hope you like it. It's usually a roaring success for us!